Internet users in Tunisia and neighbouring countries hailed the sudden departure of President Zine al-Abidine Ben Ali following widespread street protests. Tunisians used Facebook and YouTube to keep each other abreast of developments, including looting and prison break-outs on the day after Mr Ben Ali went into exile. In neighbouring countries, especially Egypt, web users hailed the ''Tunisian uprising'' and said they hoped that "the same happens at home". The popular Facebook page ''We Are All Khalid Sa'id'' (named after an Egyptian allegedly beaten to death by police) created an online, Tunisia-related event, attended by 7,000 people by early on Saturday. The event's description read: "Enough of being silent... we are not less than Tunisia... Tens of thousands took to the streets in Tunisia and succeeded in their quest to achieve liberty... We want our rights... We do not want repression in Egypt... we want to be free". Some of Egypt's most prominent opposition figures used the mini-blogging website Twitter and the video-sharing website YouTube to express their views on the Tunisian events. The Egyptian opposition figure and former head of the atomic watchdog IAEA, Mohamed ElBaradei, a few days earlier said in a message sent on his twitter account (@ElBaradei): "Tunisia: repression + absence of social justice + denial of channels for peaceful change = a ticking bomb." The leader of the opposition Al-Ghad Party, Ayman Nur, sent several tweets from his twitter account (@ayman-nour). "From Ceausescu to Ben Ali, I say to those who are frustrated, you must learn your lesson: dictatorship continues to resist; it tries to tighten its grip; but suddenly it falls in the last minute." Several Egyptian bloggers expressed solidarity with Tunisians people and hoped that Egypt "might come next". Blogger Bint Masriyah on 14 January posted a picture of the Tunisian flag and commented: "Tunisia: we are proud of your people; may the same happen to us." A Moroccan online paper, anamaghrebweb, posted a video on YouTube showing what was said to be a solidarity protest in Morocco. Algeriansunited1, a YouTube user who had previously posted videos of Algerian unrest, posted a message which reads: "Congratulations to the Tunisian people". Many international and Tunisian Facebook users have changed their profile images to that of the red Tunisian flag, in solidarity with the protesters. Large numbers of Tunisian Facebook users welcomed the departure of President Ben Ali, with some proclaiming victory in what is being called on Twitter and Facebook the "Jasmine Revolution". "A new day and the sun rises on a Tunis without the great traitor Ben Ali. Long live Tunis, free and independent," reads one Arabic message posted by the Facebook group Bye Bye 3ammar 404. Some Tunisians used the internet to report on developments, posting mobile phone pictures on YouTube, including grisly images of burned bodies from a prison fire. They also posted a picture purporting to show police in the act of looting. Tunisia was the top story for the pan-Arab satellite channels, which reported extensively on the upheaval, the arrest of Mr Ben Ali's relatives as well as the swearing-in of an interim leader. 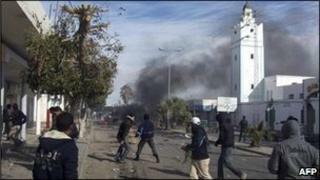 However, Tunisian TV carried few pictures of trouble on the streets. The TV did invite callers to describe what was happening in their areas, saying the army was listening and could respond. Several callers spoke about attacks on houses, shops and public facilities. Many callers urged the army to deal with the violence and looting. One caller said people were hiding in their houses in fear. Some callers complained about unemployment and salaries in recent years. A studio presenter tried to reassure viewers and urged them to call to report any attacks on any private or public property. One caller said foreigners, especially the French and Americans, should keep their advice to themselves.